Standard replacement microswitch unit- high-quality Cherry brand as used in most pinball games from mid-1980s on up. Bare microswitch body only- use the old clip-on wireform actuator from your old switch on this new unit to replace dead, sluggish, intermittent, or otherwise worn-out microswitch units in most any game. These switches have a lifespan of approximately 50,000 switch actuations, around which they will become intermittent or non-operational, and have to be replaced as part of continued operational maintenance. Available with or without diode pre-installed (select above when ordering). Image shown is without diode. SPECIFICATIONS: 90 gram actuation force. Rated 0.1 amp, 125-250 VAC. Quick-connect terminals. 3-lug SPDT contact form (common, normally-open, normally-closed). ON - (OFF), OFF - (ON) switch function. Measures 3/4 inches long x 1/4 wide x 3/8 tall, not including solder lugs. Lugs measure 9/32 inches long x 1/8 inch wide. 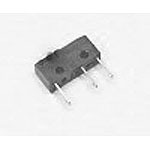 Used on factory microswitch assembly #s: 180-5010-01, 180-5057-00, 180-5116-00, 180-5157-00, 180-5186-00, 180-5198-00, 180-5210-00, 500-5142-00, 500-6227-04, 5647-12693-04, 5647-12693-19, 5647-12693-32, 5647-12693-69, DB3E-BGAF, DB3C-B1LB, and others.